The time and cost involved in checking the fill levels in banks of fire extinguishers in hazardous areas can be considerable, since it can require lengthy shutdowns and a large number of man hours. 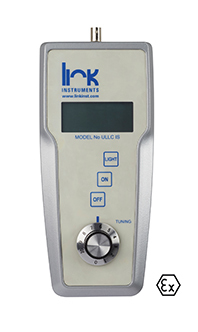 However, this is not the case with the ULLC IS from Link Instruments, which, being intrinsically safe, allows the extinguisher levels to be checked without interrupting normal operation. ATEX certified to II 2G Ex ib IIC T4 Gb, the upgraded device uses ultrasound to locate the boundary between the liquified and gaseous gas. It is suitable for fire extinguisher cylinders using liquid CO2, Halon, FM200, NOVEC, etc. In operation, the transducer is placed against the cylinder body slightly below the expected fill level and gradually raised until the reading jumps sharply. This is due to the enhanced propagation of surface acoustic waves when the transducer reaches the liquid/gas interface. “We believe that the ULLC IS is the only intrinsically safe, ATEX approved model for checking fire extinguisher fill levels,” said Link Instruments’ Dominique Christie. The instrument is supplied with an ultrasonic transducer and an extension pole for accessing bulk system installations on ships, etc. It will be particularly useful in industries such as oil & gas production and also in the marine sector. The company is also proud to state that the ULLC IS is designed and manufactured in the UK.